UNIST is delighted to announce its inauguration ceremony for the new beginning of UNIST, as it is one of the great occasions in the history of UNIST. 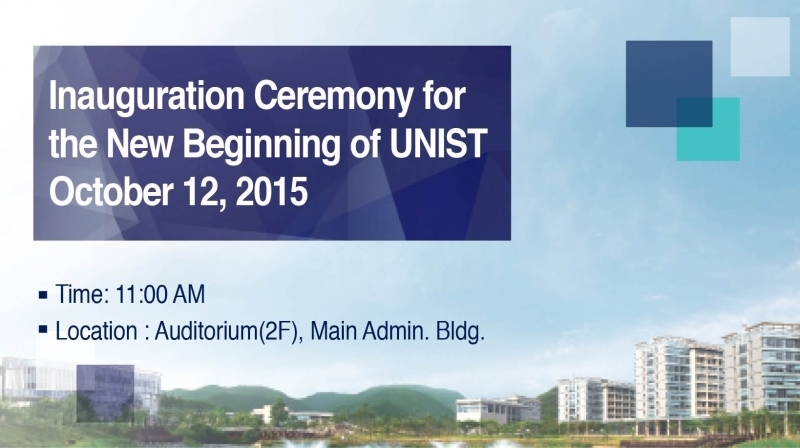 A formal ceremony will be held on October 12th to mark the official inauguration of UNIST. 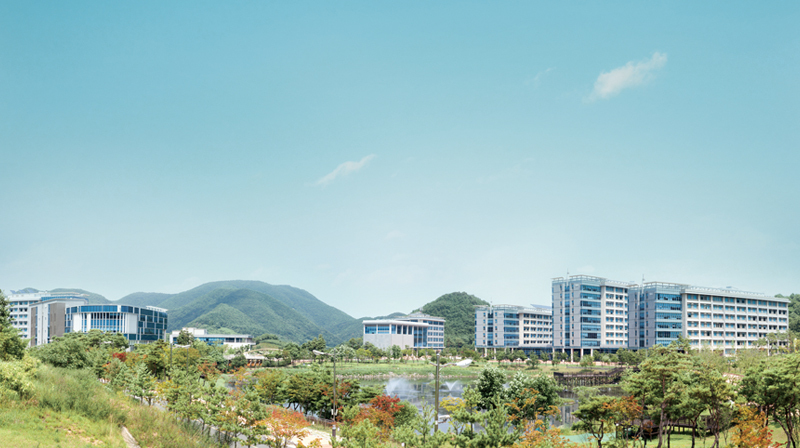 This special occasion, at 11 a.m. in the auditorium of Main Administration building, will be attended by 500 guests, including Dr. Yanghee Choi (Minister of Science, ICT and Future Planning), Mr. Gab-yoon Jung (Vice-chairman of the National Assembly), and Presidents from other S&T specialized universities, such as KAIST, GIST, DGIST, and POSTECH. 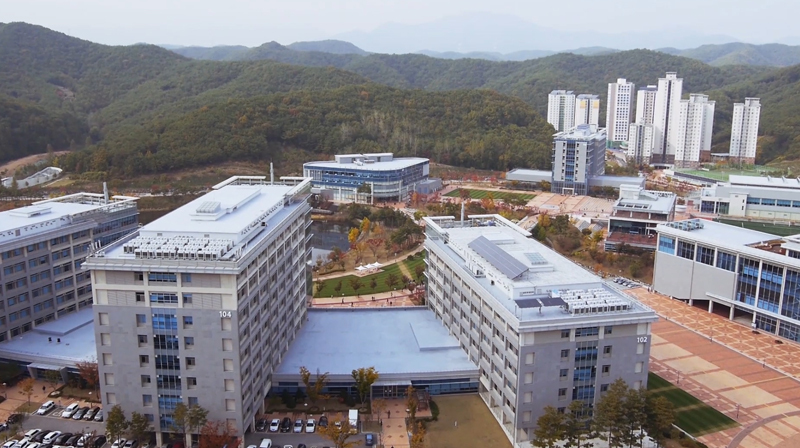 This is the first time in history a national university to make the leap from national university to a national research institute under a special law with government funding. The status change of UNIST signifies a new beginning, in essence, rebirth of UNIST. 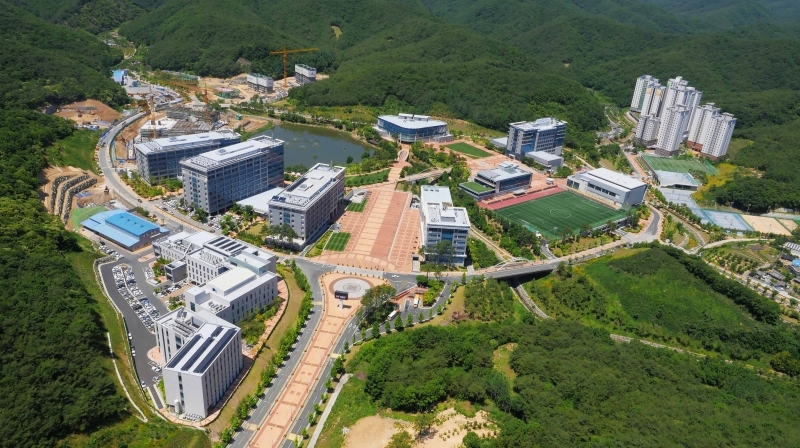 This would not only bring UNIST to range with three other Korea’s S&T Research Institutes, KAIST, GIST, and DGIST, but also a wider international recognition for UNIST researchers. 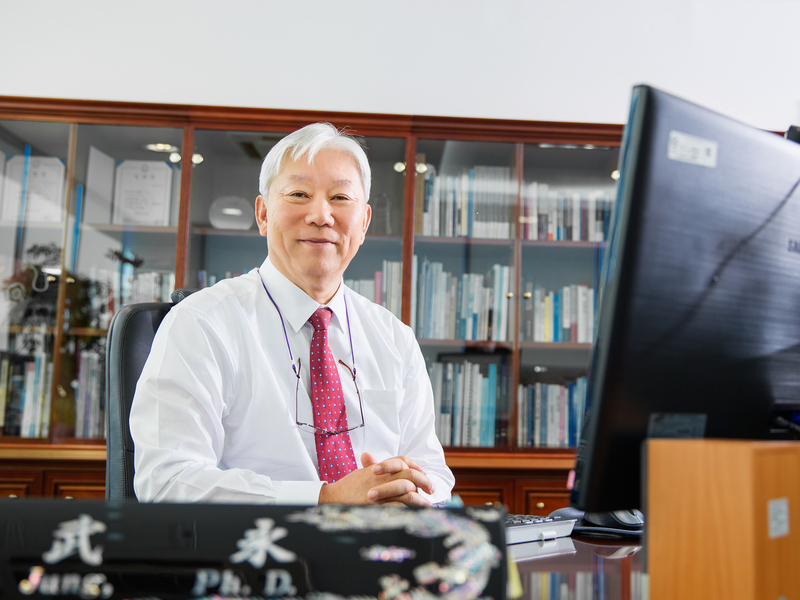 On this inauguration day, UNIST will be reborn under new leadership and values, as the official installation for UNIST’s distinguished third President, Dr. Mooyoung Jung is also scheduled to take place on campus. 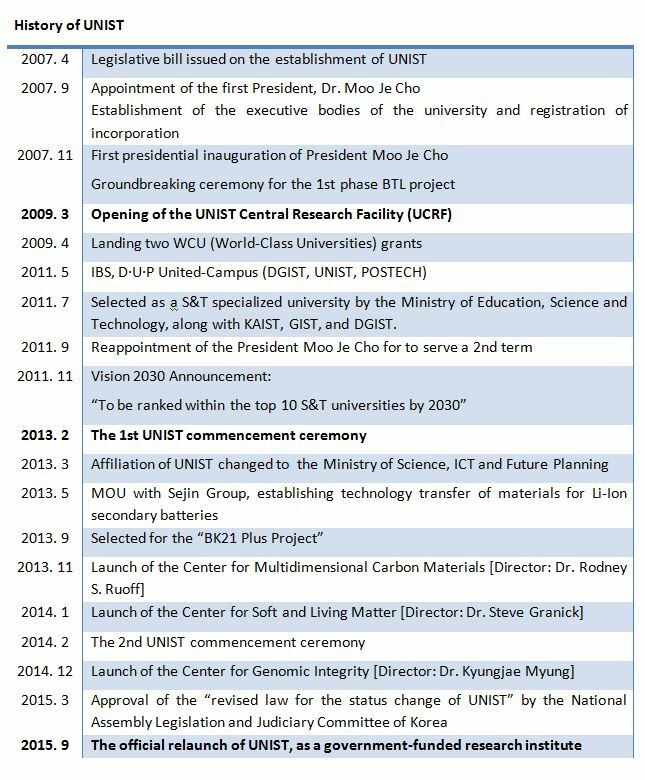 Established in 2009, UNIST has gained international visibility and recognition in science and established a foothold as a unique educational and research organization. Moreover, UNIST has been globally recognized for its outstanding research contributions to lithium ion secondary batteries, along with world’s best universities, such as MIT and Stanford University. 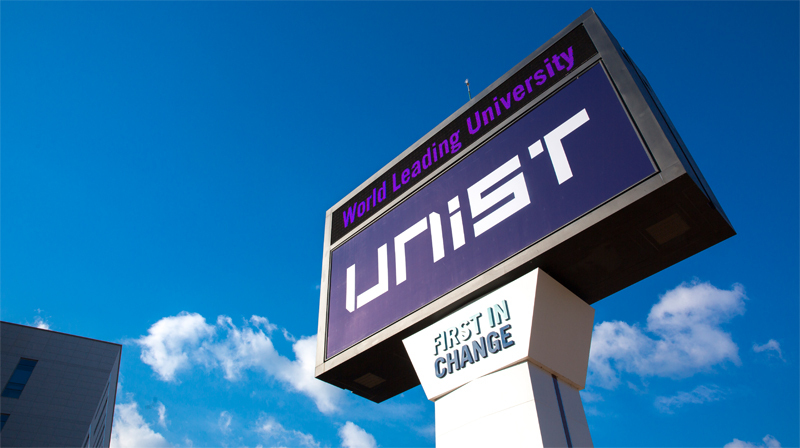 In just 6 years, UNIST’s bold moves have propelled it to become one of world’s leading science and technology universities. UNIST continues to strive to make an impact with its leading-edge research, promoting international collaboration as a driving force for excellence.